Game Night: Outbreak! | Kris Johnson's Blog…sort of. It seemed like any other Game Night: Chris was running us through another session of his homebrew campaign (based heavily on the world of Amber, created by Roger Zelazny), we were spending about as much time on conversational tangents as actual roleplaying, and there was cake. A Tuesday night like many before it, until the deep, concussive sound of an explosion rattled the windows of the International House of Johnson. Dave, Chris and I ran for the front door. Laura turned on the television and tuned to the local news on Channel 5. Rachel sent a message to Twitter from her cell phone; 140 characters announcing to the Internet that something nearby had exploded. We scanned the treeline and saw it: a large mushroom cloud—too small to be nuclear; besides which we’d already be dead if it was—to the northeast, somewhere near the junction of Route 2 and SOM Center Road. No sooner had we registered the cloud than we heard the screaming. People all through the cul-de-sac had come out of their homes and the sounds of agony surrounded us. We watched in horror as across the street Rick fell to his knees, his face a mass of hideous, black blisters that burst and sprayed a tar-like substance over the pristine concrete pad of his driveway. Something in the house next door exploded, a soft whump followed by the shattering of windows…then flames licking toward the early evening sky from inside. The idea that I should attempt to extinguish the fire was pushed to the back of my mind by more screaming, this time from right behind me. I turned to find Dave in the grip of some unseen agony. Unseen, that is, until his shirt split at the seams and I caught a glimpse of green scales. I took a step back and nearly tripped over whatever it was that now occupied Chris’ t-shirt and khaki shorts. The thing—gelatinous and translucent, seemed to melt, oozing out of—no…no absorbing—the clothes and coalescing into an amorphous blob that slid down the gentle slope of my lawn toward the street, leaving a wide scar of burned grass in its wake. Dave was on the ground now, writhing and twisting as his body expanded well beyond the capacity of his clothes. I took another look…and ran. Ran away from the horrors that used to be my friends and back toward the house. There was no question about what had just happened: somehow, somewhere nearby the wild card virus had been released in the eastern suburbs of Cleveland. Rick—and most of my other neighbors, it seemed—had drawn the Black Queen: a mutation that meant death, usually a very, very painful death. The same appeared to be true of Chris, while Dave had probably drawn a Joker as the virus invaded his body. A Joker meant that Dave would live, though whether that made him better off than those who didn’t might be a matter of perspective; the virus didn’t kill him, but it was mutating him into something that probably wouldn’t resemble a human being for much longer. I dreaded what I would find inside. There was no screaming from, but that could mean that Laura had drawn the Black Queen, too. No, there she was, very much alive and looking very much like Laura. She was kneeling over a prone figure on the floor. Rachel, like Dave, had drawn a Joker. A spiral horn had erupted from her forehead, and I couldn’t help but think of unicorns…and faeries—a pair of gossamer wings spread from between her shoulderblades. Her hair was longer, too, at least waist-length and a rich red in hue. “We have to get Rachel to a hospital,” Laura said. My mind raced in a hundred different directions at once, but I couldn’t focus on a clear course of action. I nodded, glad to have the decision made for me. I half-lifted, half-dragged the unconscious Rachel to the front door. I whirled toward the source of the pained, gutteral words. Dave was on all fours, doubled over in pain. Scaly protrusions outlined the ridge of his spine and a thick, green tail jutted from just below the small of his back. Dave’s gas-guzzling, military-inspired monstrosity was parked on the curb. The keys were in the shredded remains of his pants and Laura, when she recovered from seeing the ex-Navy SEAL transformed into a human-lizard hybrid, retrieved them with trembling fingers. I shouldered Rachel into the back seat, then went back to help Dave. He was impossibly heavy; there was no way I’d be able to even drag him across the lawn, much less lift him into the vehicle. He fought through the pain, staggering to his feet and stumbling toward the Humvee. “Drive!” he muttered, climbing into the back seat next to Rachel. The Humvee listed as Dave managed to somehow cram himself—tail and all—into the back seat. Laura climbed into the front passenger seat as I pulled the driver’s door closed. I hadn’t driven a standard transmission in at least ten years, but necessity trumped nerves and seconds later the Humvee was swinging around the cul-de-sac and roaring toward Euclid Avenue. I uttered a curse—probably several—and slammed on the brakes. Euclid was a snarled mess of cars and trucks, some trying to maneuver toward East 305th Street, others stalled or crashed and now blocking traffic, their drivers either dead at the wheel or having abandoned the vehicle in the street. As bad as it had been in the cul-de-sac, it was a thousand times worse on the most traveled surface street in Lake County. Horns honked, people shouted (or screamed, as the Black Queen took her sweet time finishing a few of the unlucky ones off) and a logjam of steel and fiberglass stretched out in both directions. It took me a moment to free myself from my usual minivan mindset and realize that I was driving a Humvee. I shifted into four-wheel drive and pushed the big truck into the fray. Metal shrieked, glass broke and rubber stuttered on concrete as I pushed cars out of my way, not caring whether their occupants were alive or not. Ploughing toward the opposite side of Euclid Avenue, I finally encountered an obstacle that the seemingly-irresistable Humvee would not move: a large black SUV. I uttered another curse and felt the Humvee rock on its suspension as Dave hauled his bulk out of the back door. Slack-jawed, I watched as Dave—at least eight feet tall now—gripped the rear bumper of the Escalade and lifted. The SUV rocked and I recovered my wits enough to let my foot off the Humvee’s brake. With Dave’s help, I pushed the Escalade onto its side and we were able to squeeze past it. We ploughed along, parallel to Euclid Avenue, cutting through the parking lots of a lawn tractor dealership, a bar and grill, a convenient store. Dave added his power to that of the Humvee when our forward progress was arrested and we rolled through—and in one case, over—the dozens of parked cars between us and East 305th Street. It took us an hour to reach Route 2, the freeway I hoped would whisk us to downtown Cleveland and The Cleveland Clinic, but the sight we found when we finally crossed the railroad tracks made my heart sink: a virtual lake of vehicles, none of them moving, many of them sporting familiar red-and-blue flashing lights. Route 2, and by extension The Cleveland Clinic, was simply out of reach; we were going nowhere. With apologies to Chris Miller. We didn’t mean to kill you, really. The Game: Wild Cards, a Mutants & Masterminds sourcebook from Green Ronin Publishing. Written by John Joseph Miller and designed by Steve Kenson. 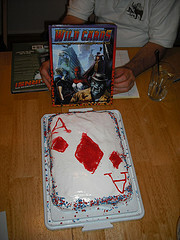 Wild Cards is based on the series of novels by the same name, edited by George R.R. Martin and featuring stories by Melinda Snodgrass, Roger Zelazny, Walter Jon Williams, John Joseph Miller and many more. On September 15, 1946, the alien xenovirus known as Takis-A was released over an unsuspecting New York City. The virus killed most it infected instantly, while a lucky few were granted superhuman abilities and others were horribly mutated. Players: Dave “Scales” Berg, Kris “I Feel Fine” Johnson, Laura “I Feel Funny” Johnson and Rachel “@TheInternet OMG, Something Just Exploded!” Ross. @Greg — Thanks. I hope to have part two posted later this week. I was secretly glad to be unconscious during the whole “which way do we turn on Euclid?” “No wait the traffic is too bad that way…” snarl. I’m so bummed that the recording didn’t work out. This would’ve been fun to listen to. Sorry about you going out Senator Kelly style, Chris. @Miscellaneous G — I think Gus has a very special card up his sleeve for you. I’m not sure it’s an Ace. @Rachel “@TheInternet OMG, Something Just Exploded!” Ross — Please! A little respect for the acidic and oozing! @Jahnoth — In the future, I think I’ll make recording Game Night standard operating procedure, whether such recordings are ultimately destined for release or not. @Chris Miller — Indeed. And also splortch. Actually, Gus wasn’t heavy on the sound effects so I had to imagine my own ooey, gooey aural goodness. @Kris Oh, er, I’m sure she just wanted to MOURN. Respectfully. @Kris – I’ll keep bringing that H2 I borrowed from work, now that I know how to use it, thankyouverymuch. Ready for Part II of the demise… er, adventures of the International House of Johnson. @Jahnoth — Yep. Working on Part II as we speak. Should be in the queue for release right after the second part of the write-up for our Marvel Heroes game. Yup. @Kris – *knock knock knock* Hello? Anyone here?